The heat of a sauna room raises your skin temperature to 104 degrees F and your internal temperature to 100.4 degrees F, causing your heart rate to speed up and your blood vessels to dilate. Sessions in a sauna room are usually short; you only need 10 to 20 minutes to create a good sweat and reap the sauna’s benefits. But if you have any health conditions or are using any medications, be sure talk with your doctor about sauna rooms first. The primary benefit of a sauna room is its ability to relax and de-stress you. The increased heat soothes sore and tense muscles all over your body, giving you a refreshed feeling once your session is complete. The increased blood flow also helps bring more oxygen to those sore and tense areas. Using a sauna after exercise will also help your body relax while keeping your heart rate up. The most noticeable effect of a sauna room is that it makes you sweat. The process of sweating cleanses your skin, but also cleanses toxins from food and drink out of your body. This kind of cleansing in a sauna room can help give your liver and kidneys a lighter load, and can help people with liver and kidney problems--check with your doctor first--although it is not a replacement for proper eating. While in a sauna room, your heart rate will increase and your blood vessels will dilate. This allows your body to pump more blood throughout your body without significantly raising your blood pressure; the effect is similar to that of a brisk walk. While this is no replacement for exercise, it is a great way to boost blood flow, especially to the extremities and upper skin layers, where blood circulation is usually minimal. Other benefits of sauna rooms include relief from arthritic pain, asthma, and other respiratory problems. While time in a sauna room is not a cure for these problems, it can aid in the healing of chest congestion, sinusitis, bronchitis and laryngitis. Harvard Health: Sauna Health Benefits: Are Saunas Healthy or Harmful? Dr. Weil: Skittish About Saunas? 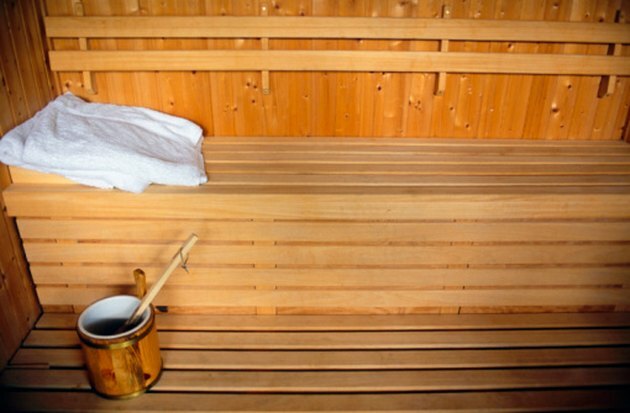 How Many Calories are Burned in Infrared Saunas? What Are the Dangers of Exercise After Cardiac Ablation?